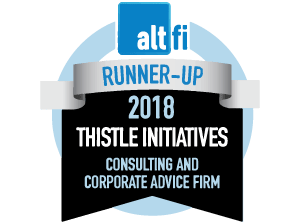 We Thistle Initiatives Limited (also referred to as “Thistle”, “we”, “us”, or “our”) are a registered company in England (Company no. 07078648). Our registered address is 80 Coleman Street, London, England, EC2R 5BJ. We take the security of the data and information we hold seriously. This notice is designed to help you understand what kind of information we collect in connection with our services and how we will process and use this information. Most of the information we collect and use will be about your business or your firm, but in the course of providing you or your firm with our services, we will also process information that is commonly known as personal data. Personal data may contain information which is known as special categories of personal data. This may be information relating to an individual’s health, or racial or ethnic origin. Where we collect data directly from you, we are considered to be the controller of that data i.e. we are the data controller. Where we use third parties to process your data, these parties are known as processors of your personal data. Where there are other parties involved in managing your data, we will be a joint data controller of your personal data. We will process your personal data to allow us to perform our contract with you and to provide our services to you. We will also process data as required by law. In some situations, we may request your consent to process your personal data for specific purposes, or to market our services to you, to share your data or to transfer your data outside the European Economic Area. Where we require consent, your rights and what you are consenting to will be clearly communicated to you. Where you provide consent, you can withdraw this at any time by contacting our Data Privacy Representative by e-mailing dp@thistleinitiatives.co.uk. Sometimes we may need to retain your data for longer, for example if we are acting on your behalf or defending ourselves in a legal dispute or as required by law or where evidence exists that a future complaint may occur. Please contact our Data Privacy Representative at dp@thistleinitiatives.co.uk for a list of countries and organisations your personal data is transferred to and/or for further information on the measures undertaken to safeguard your data. You should understand that when exercising your rights, a substantial public or vital interest may take precedent over any request you make. In addition, where these interests apply, we may be required by law to grant access to this data for law enforcement, legal and/or health related matters. If you have any questions regarding this notice, the use of your data, your Individual Rights or you object to the processing of your personal data as described within this notice, please contact our data privacy representative by writing to the Data Privacy Representative at 80 Coleman Street, London, England, EC2R 5BJ or by e-mailing dp@thistleinitiatives.co.uk or by telephoning 0207 436 0630.